Algeria is facing a new era in the wake of the resignation of President Abdelaziz Bouteflika. Questions abound as to what happens next for this resource-rich nation and Western ally in the fight against terrorism. Algeria's 12-member Constitutional Council is expected to meet this Wednesday to confirm the departure of President Bouteflika. The ailing leader submitted his resignation with immediate effect yesterday, ceding power in the face of widespread street protests after two decades at the helm. National television showed a frail Bouteflika handing his letter of resignation to Constitutional Council president Tayeb Belaiz. The current upper house president is Abdelkader Bensalah, a Bouteflika ally. However the protesters who drove Bouteflika out want a drastic change of Algeria's political elite, seen as corrupt and secretive. 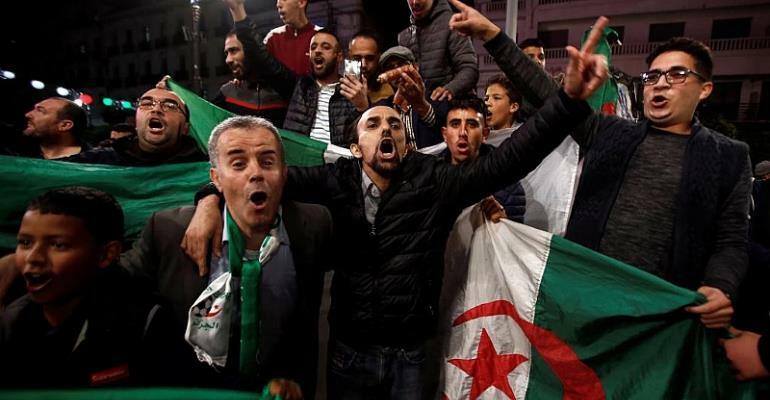 Following Tuesday's announcement, car horns sounded on the streets of Algiers before crowds of flag-waving people emerged from their homes and converged in the centre of the Algerian capital to celebrate. State news agency APS quoted Bouteflika's resignation letter as saying. "I have the honour to formally notify you of my decision to terminate my term of office as President of the Republic from today, Tuesday." The letter continued, "this decision, which I take in my soul and conscience, is destined to contribute to the appeasement of the hearts and minds of my compatriots, to allow them to take Algeria towards a better future to which they legitimately aspire." Long accused of clinging to power, the leader who came to office in 1999 had faced mounting pressure to step down after his decision to seek a fifth term despite rarely being seen in public since suffering a stroke in 2013. The moves failed to satisfy protesters who feared a ploy to extend his rule and the armed forces chief called for Bouteflika to step down. In a statement, Le Drian added "we are confident in the ability of all Algerians to continue this democratic transition in the same spirit of calm and responsibility" that has prevailed in recent weeks. Meanwhile, the United States' State Department has said the future of Algeria is now up to its people. Spokesman Robert Palladino told reporters that questions about how to navigate the transition are for the Algerian people to decide. As rumours circulate of behind-the-scenes manoeuvring, Algerian prosecutors announced earlier this week that they had banned corruption suspects from leaving the country after launching investigations into unnamed individuals. The authorities did not say who was being targeted by probes into fraud and illegal money transfers abroad, but they followed the arrest of the president's key backer, businessman tycoon Ali Haddad. Haddad, described by Forbes magazine as one of Algeria's wealthiest entrepreneurs, was detained at the weekend at a border post with neighbouring Tunisia.